Throughout the summer and across the country, there are a bunch charity rides to participate in. 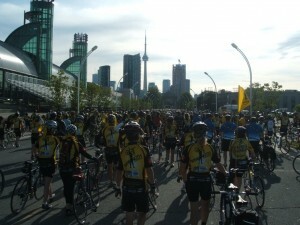 Last week, I had the opportunity to participate in the Ride to Conquer Cancer; a 2 day 200 km event in support of cancer research at the Princess Margaret Hospital in Toronto. The first day started at the CNE in downtown Toronto, and rode along the flat lands of the southern lake to Hamilton. Day 2 took us all the way to Niagara Falls. There were 3,530 riders in all. Riders of every age, size and ability were present. Grandfather and father, Mothers, daughters and sons all made the effort to complete the ride. Some on road bikes worth thousands of dollars, some on beater bikes just pulled out of the garage, but everyone had the same goal and destination in mind. I imagine that each rider had a special reason for participating as cancer has likely touched us all. Cancer survivors were provided bright yellow flags to display on their bikes and there were lots of flags flying. Living proof that events like this create results; the weekend raised 14.5 million dollars! Riding through the finish was one of those heart-in-throat experiences. Because I am blessed with good health, I am able to participate in events like this. Canadians across the country are participating in walks, runs and rides to help others. It is the way we give back to our communities. One of the other reasons I am riding is to support “Cameron Helps”. Five years ago, my best friend’s son committed suicide. As unimaginable as that event was, he was able to funnel his pain into positive energy and created a charity to help kids in crisis. That charity is doing wonderful work encouraging teens to become involved in running and offering support for families. His loss has saved countless other kids. On Father’s Day, there was a 5k walk/run to support this charity in Mississauga, Ontario. Another way people were able to help each other. We are not just people who ride bikes. We are a community and we can all contribute to our own neighbourhoods to make a better place for everyone. Follow the links page on my website www.davidraithby.com for more information on Cameron Helps.